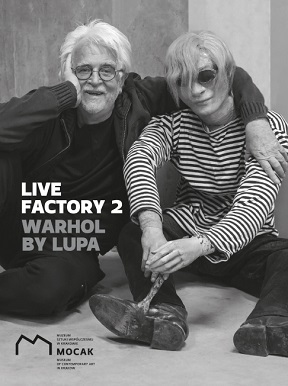 The publication accompanies the project Live Factory 2: Warhol by Lupa, an interactive installation created by the director Krystian Lupa on the basis of the stage stet for his production Factory 2, which premiered at the Helena Modrzejewska National Stary Theatre in Krakow in 2008. Besides an introduction by Krystian Lupa, the book also comprises Kenneth King’s recollection of Andy Warhol as well as texts about the production Factory 2 and Lupa’s idiosyncratic theatre by Miriam Guretzki, Laure Adler and Maria Anna Potocka. There is also an essay by Zofia Kerneder-Giemborek on the transpostion of a theatrical stage set into a museum space. The illustrations comprise photographs from Andy Warhol’s Silvery Factory as well as photographic documentation of the production and the installation at MOCAK.